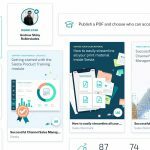 Partnering with push conference 2018 Munich – discount and goodies! We are happy to announce that we are partners for the push conference 2018, taking place in Munich in October. We will therefore be giving away a discount for everyone who wants to attend. Use the code push18oykFjSHuxvienna when ordering a ticket and get 10% off the regular price! 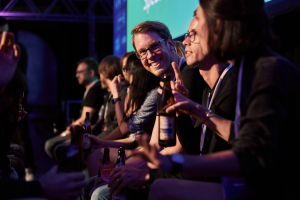 For the 7th time now, more than 600 experience designers and creative technologists will meet this October in Munich at push conference to take a close look at all things interactive. As always, there will not just be talks and workshops but also a hands-on exhibition showcasing interactive projects from graduates and design studios all the way to companies like Bosch and BMW. And to continue the conversations during break time, there will be plenty easy going networking and side activities including a free Warmup night, Failure Slam and some more! 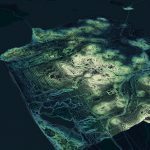 Shan He, who is a Senior Data Visualization Engineer at Uber, gives a glance at how her team creates live 3D data visualisation tools for the browser, that also help them understand their users and their business better. What’s next is always the big question. Josh Clark will explore some of the possibilities to use machine-generated content, insight, and interaction as design material in everyday work. The challenges and opportunities of machine learning are plenty; learn to handle this powerful new design material with care and respect. As Design Tinkerer at Google, Adrian has experienced many times that good design and ideas don’t happen naturally. Adrian will share his recipe for how to transform the fragile idea of one person into a vision and a movement that unites and inspires a whole group to actually make things happen. Anders, Head of UX at Danish Broadcasting service, will show you how to escape tunnel vision and start focusing on building the right thing. The silver bullet is systematic and constant product testing. Anders will take the boring part out of testing and show you how easy it can be. He will reveal his playbook of cleverly thought out product experiments used by product builders at companies like Spotify, Booking.com, Facebook, Amazon, and Google and recommended by top universities like Havard, MIT, and Stanford. Besides the talk you can also explore this topic deeper in his workshop on Oct. 18th. A complete look at interactive design in 2018, really. 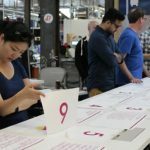 Join push conference on October 19–20 to connect to a keen and like-minded crowd of UX and IxD professionals from product teams like Mozilla, BMW or Bosch to visionary consultancies like frog, icon incar and IDEO as well as from aspiring startups. We are media partners of the Web Event of the year in the Czech Republic. 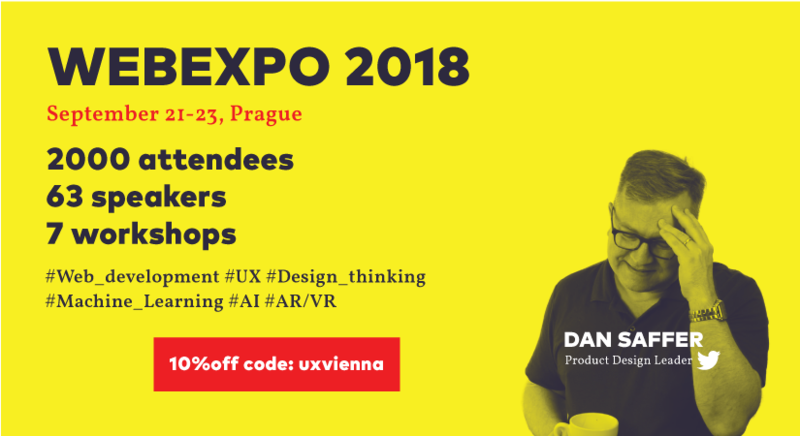 WebExpo will bring this year 63 international and local experts from well-known companies such as Facebook, Twitter, Google or IBM among others, to share solutions on UX and Design Thinking, Web Development, AI & Machine Learning and AR/VR that you can learn through practical talks and 7 hands on workshops. Learn more in its program. Dan Saffer – how do you find the best design opportunities the future of your organization? At Twitter, they’ve been using a combination of methods to plot out a set of possible futures for themselves, looking a few years into the future for product opportunities. He will explain their methodology and process so that we can use it in your work. Val Head – 2018 is the year of Machine Learning. But, how does it affect the role of web designer and developer? Val will show to build AI-Driven features. Douglas Powell – He is a Distinguished Designer at IBM, directing the program to scale design and design thinking across the global tech company. He will present a discussion about how to measure the value of design for an organization. 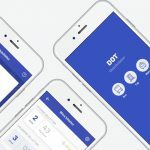 Diamond Ho – Ever wonder how a designer at Facebook designs for 2 billion people around the world? It’s all about using design thinking methodology and working cross-functionally. In her session, she’ll make a (hypothetical) case study to learn about how they design product experience at Facebook. Pamela Pavliscak Workshop – Emotionally intelligent design: If your smartphone could recognize when you have a bad day, wouldn’t use it? Pamela Pavliscak will teach at WebExpo how to prototype emotionally intelligent technology. The organization informs that they will have different activities to encourage the networking such as workshops, meetings with speakers after each talk and meeting areas. 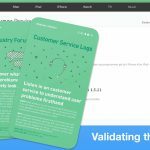 Thanks to this cooperation, we are going to give away one FREE Conference ticket to attend this event and provide a code with 10% off specially created for us: uxvienna (must be inserted in lowercase).